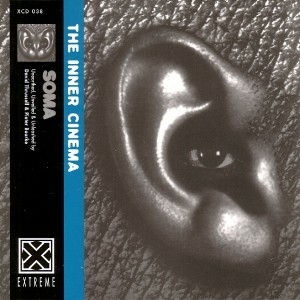 The new SOMA e.p., “Stygian Vistas”, builds upon the success of previous albums, “The Inner Cinema” and “Hollow Earth”. Australian musicians David Thrussell and Pieter Bourke present a fresh new collection of gourmet aural delights. “Stygian Vistas” includes new tracks and remixes from Nonplace Urban Field, Francois Tetaz (Shinjuku Thief) and Fetisch Park. SOMA also remix some of their own tracks with a succinct version of the title track and one of the classics from the “Hollow Earth” album, ‘God Sends the Meat and the Devil Cooks’. “Stygian Vistas”, with its smouldering beats and wafts of subconscious soundscapes, leads the listener down a warped and winding road. Sumptuous disjointed rhythms collide into each other as spaced-out tranquility lurks in the background. SOMA is an exciting musical melting pot for THRUSSELL and BOURKE and “Stygian Vistas” is no exception. “Stygian Vistas” gives you all the more reason to experience SOMA live and to keep your eyes peeled for the video on the more adventurous TV and cable programs. “Stygian Vistas” journeys further into the dance, ambient, electronic, weird and world sounds that exemplifies the aural wizardry of SOMA. Formed and Performed in THE CRYPT 1996/97. All tracks digitally mastered by SOMA and Frank T?taz. SOMA is a member of M.A.C.O.S. Images by SOMA & Jacek Tuchewski at NADIS Design.